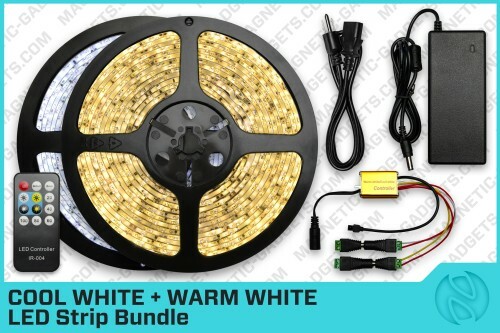 The Cool White + Warm White LED Strip Bundle is the most versatile White LED Strip solution available. You get one Cool White LED Strip, one Warm White LED strip and everything that you need to make them work. Using the included specially designed Cool white/Warm White LED Controller, you can control each Strip individually and adjust their brightness. You can also turn them both on at the same time and adjust the intensity of each strip to get the color temperature that you need for your application. This strip bundle works best when both 5 meter LED Strips are installed side by side. LED strips offer creative options for upgrading the lighting of any room. Our LED strips can be used to set the mood in bedrooms, living rooms, conference rooms and office reception area. It’s also the coolest way to decorate any vehicle, bar and display counter. LED Strips are great for creating the perfect lighting for everyday living to party lighting.